This is not the first time Telcos had urge NCC to regulate OTT services like WhatsApp, Facebook, Twitter, Youtube, Skype among others. Sometimes last year, Telcos threaten to block OTT services like WhatsApp and Skype because of revenue losses from international calls and are scared they “may lose between N20tn and N30tn by the end of 2018. 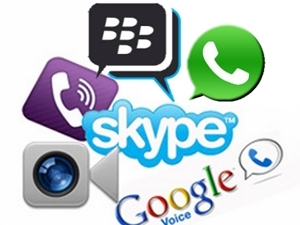 Now again, Telecommunications Operators of Nigeria (ALTON), has called for the licensing for and regulation of Over-The-Top (OTT) services such as YouTube, Facebook, Twitter and WhatsApp Messenger to generate more money for the country. ALTON chairman said OTT services are surely a threat to network operators but we cannot rule out the fact that users need to have an active Internet subscription — provided by the ISPs and telcos — to be able to access these services. He noted that telecoms operators were only licensed to supply voice, data and text messages for which they were charged on annual basis. NCC had earlier rejected Telcos plea last year, said OTT services cannot be regulated. I wonder why Nigerian Telcos are complaining; moreover, they have data subscriptions tailored to some of these services. What is their problem sef. They better think of how to generate income through other sources. Good for nothing network providers. is it not their data subscriptions we are using? They had better change their business model and make data cheap and easily accessible, else the unstoppable wave will wash them. Telecoms be warned..
Lol, una zap our data and still not satisfied. Is this not witch craft? Not surprised at all because I have been expecting them to renew their call for this. These people are simply wicked they are only after their pocket. I don’t understand why they want to tell us how to use our data. Their responsibility is to sell data while our own responsibility is to consume and if we like we leave it till it expire. The issue is that most of them are not Nigerian companies so they came here to make profits and that is what they care about. The data wey dem de zap never do them? Generate income for the country, really? Are they to teach us how to use our data? These idiots are overstepping their bounds. Data that i purchased with my hard earned money. Them no well. No be only regulate. If only all my contacts are on whatsapp or messenger and are usually online, i won’t even bother calling with airtime again. They should just respect themselves and allow people to use these services anyhow they want. Are they not charging us for the data ?